Cycling is a very popular mode of transportation here in Cambridge, the roads being narrow, laden with traffic lights, and crammed with cars commuting from nearby towns. A bike was one of my first purchases upon arriving, and already I was planning trips to surrounding towns and natural sites. With spring coming on, I decided it was time to go for a long ride. I decided to pay a visit to Anglesey Abbey and Wicken Fen for total of nearly 30 miles through farmland and fen. This fellow spends his days watching cars rush by. His gaze was unbroken the entire time I watched. Almost immediately after I’d made it out of Cambridge the landscape changed dramatically. The sprawling suburbia I’m accustomed to between the stretch of cities on the East Coast was totally absent. Farms butted right up against the path where I rode, and soon even the highway veered in another direction carrying its thrumming payload of cars somewhere else. At this point I didn’t see very much other than fallow fields, looking like they’d been plowed fresh for the next planting season. Soon I’d arrived to Anglesey Abbey, established as a priory and later becoming the estate of Lord Fairhaven. Left under the care of the National Trust, they offer tours of the house and grounds. The house was closed during my visit, but since I don’t have much interest in the fine ways of the wealthy, I wasn’t disappointed. Instead I made my way along the garden path that lead to my primary interest – an operational water mill from the late 18th century. 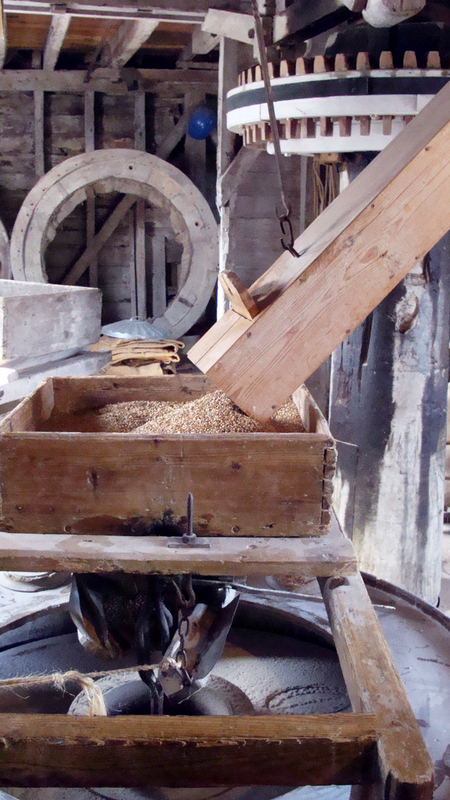 The mill’s machinery: grain pours in through the hopper, falls through the damsel, and is ground by the stones at the bottom of the picture. A waterwheel spins the gear visible on the right. Though the mill was only brought back to working order in the last few decades, many of the parts are over 150 years old. Grain is hoisted in sacks by a system of pulleys, then loaded into the hopper in the photograph. As the grain falls through the hopper, an iron gadget called a damsel scatters the grain onto the bedstone over which the runnerstone rotates and grinds. The term damsel comes from the chattering sound the damsel makes when the mill is operating. When grain ceases to run through the damsel due to a jammed hopper or lack of grain, this sound changes dramatically. Apparently this the origin of the term “damsel in distress”. The miller had to quickly fix the problem, as insufficient grain can cause the stones to heat, scorching the flour or even cracking the millstones. A benefit of a visit to the mill is the opportunity to buy freshly ground flour or oatmeal. Since I’d recently picked up a back of wholemeal flour, I opted for the oats. I purchased my bag as wheat flour was being milled, the grinding of the stones and turning of gears shaking the entire building. Seeing the machinery at work, I wondered how the operation could be adjusted for beer brewing. In brewing the barley should be cracked or crushed without shredding the hull. With a motor-driven roller mill, the technology which eventually replaced wind and watermills, this is not a problem, but it is hard for me to imagine repurposing the grinding stones of this mill for brewing. What can be found down this path? I’ll never know. An experience that repeated itself about two dozen times before I left. Returning to the gardens, I met my only disappointment of the day. While I didn’t mind the house being closed, many of the gardens were closed as well. The Abbey is currently a bit between seasons, with many of the plants that flourish in winter now wilting and the summer blossoms not yet in bloom. 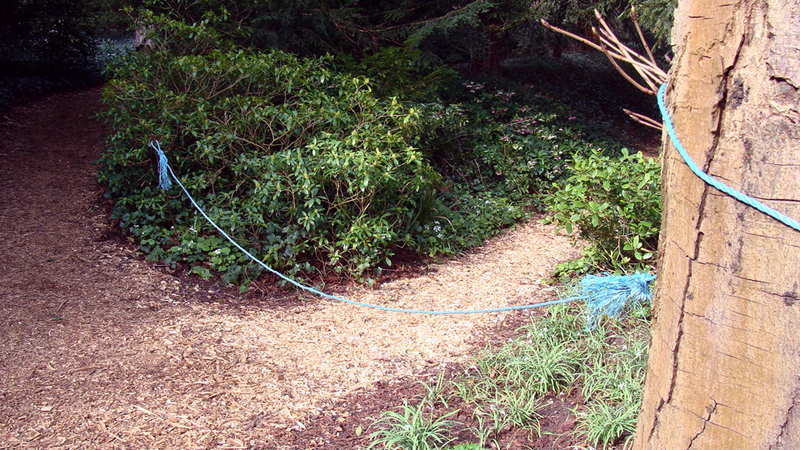 Ropes restricting access become a common sight, presumably to protect developing flora. While there was an extensive natural area that I’d not explored, I’d felt I’d had enough. Besides, with the fens in my future, I would be at no lack for nature. I resigned myself to snapping a few photos of what I could see, mostly at the request of Colleen. 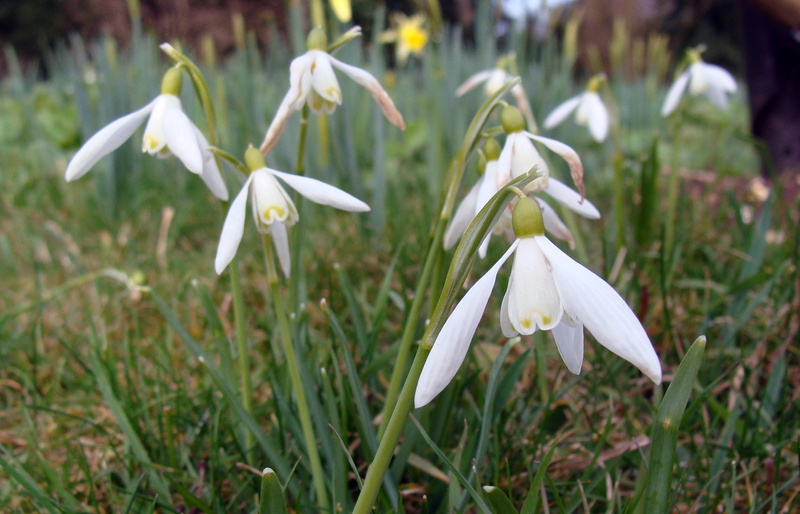 Fortunately no amount of ropes could hem in the abundance of snowdrops growing on the grounds. The Abbey is famous for the flower, and even discovered a new cultivar which subsequently received the name of the gardener who made the discovery. The ropes also failed to hold back the fresh spring scent which filled every breeze, despite the relatively poor state of the gardens. Back on my bike, I began my tour of the fens before I even arrived at the nature preserve. On the way to Wicken Fen, I passed through Burwell and Bakers Fen, which had both been drained for agricultural use and have only recently been reclaimed by the National Trust for restoration. 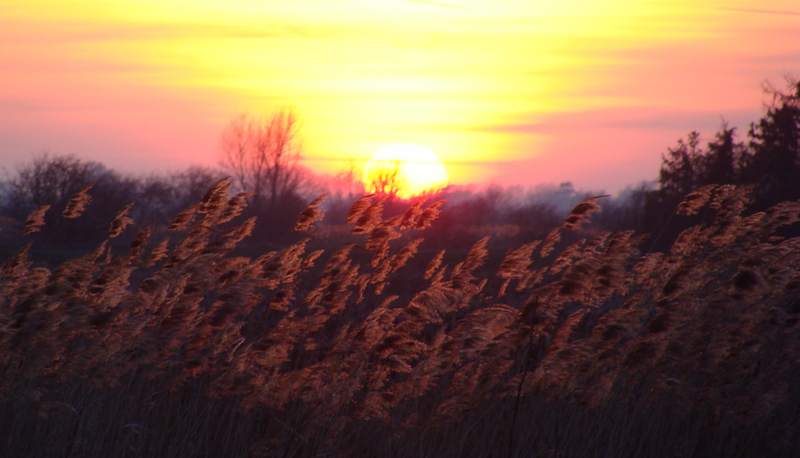 View of Burwell Fen. You’re just going to have to click on this one to really see it. The area is very popular with tourists and locals alike. 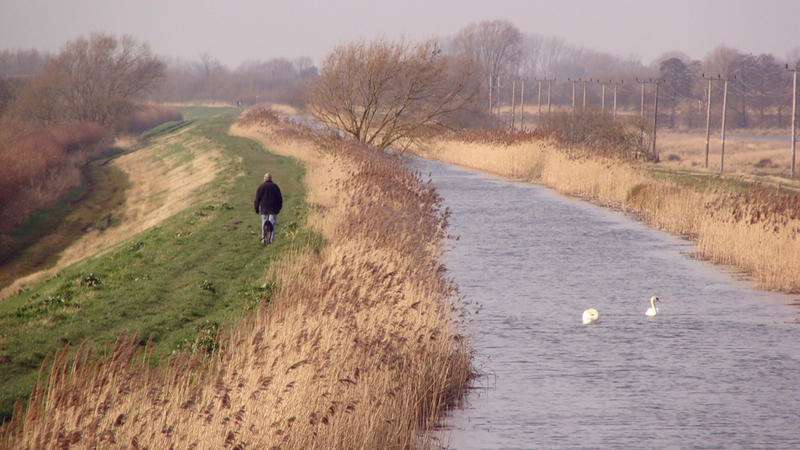 Many seem drawn towards the destination, Wicken Fen, but I saw quite a few locals walking dogs or riding bikes along the lodes and footpaths towards no particular end. 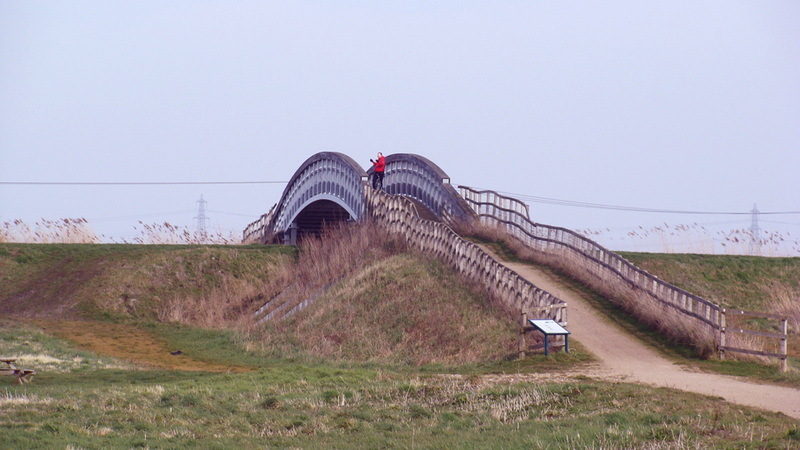 This bridge over Reach Lode is visible in the distance in the panorama above on the right side. Reach Lode viewed from the bridge. Besides letting the land flood in the winter rather than draining it as the farmers did, a major component of the restoration is the introduction of Highland cattle and Konik ponies for grazing. 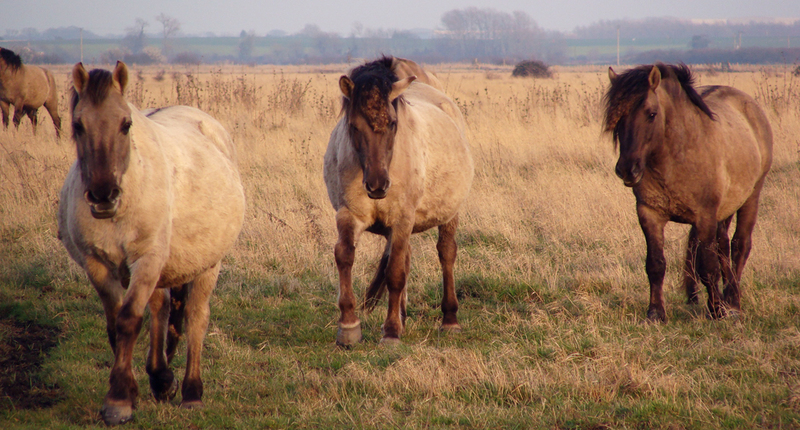 The cattle graze by tearing up grass while the ponies clip the grass with their teeth, leaving different heights of vegetation to serve as diverse habitats for insects and other wildlife that form the fen ecosystem. 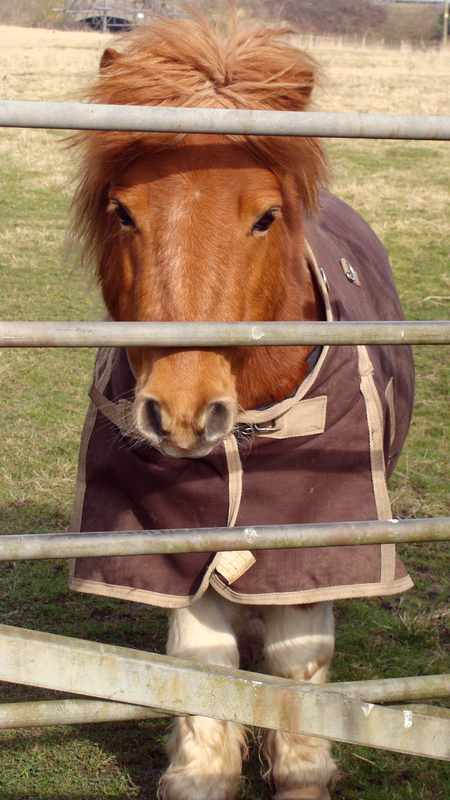 The cattle and ponies are free ranging and were introduced at low density to prevent overgrazing. There are fences on either side of the bike path to prevent any curious animals from harassing cyclists, but there are quite a few points on the trail where there are gaps in the fence, presumably for conservationists to tend to the animals and land. While stopping to snap a picture of some ponies, they noticed me, and after studying me for a minute they started to amble over. Wicken Fen itself was a bit worse for wear when I arrived. England has been experiencing extreme rain and wind this season and many regions have flooded. While it hasn’t been so severe in Cambridgeshire, some parts of the paths through the fen had to be closed to protect vegetation that has been left particularly vulnerable from the unusually wet weather. 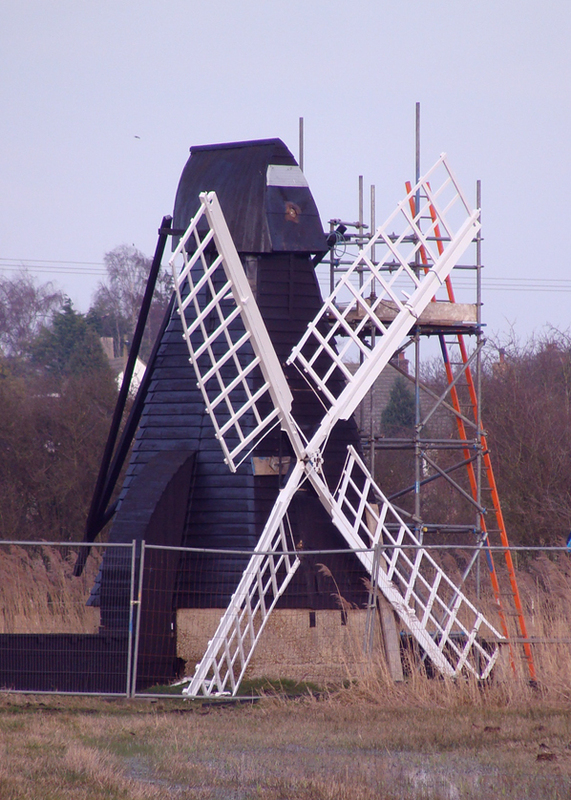 Additionally the high winds proved to be too much for the old windpump, and tore the blades off the body. The pump used to be used to keep peat diggings dry, but is now repurposed to pump water into the fen from the lower lands surrounding. Such pumps are necessary because the draining of surrounding fens caused the soil to contract and sink, literally leaving the undrained Wicken Fen high and dry. To protect the fen from draining due to its newfound relative elevation, this wooden windpump was moved in and another windpump was constructed. Despite the closings, the fen left me with no disappointments (unlike the Abbey). The landscape is so rich in sights, sounds, and smells that even in the two and a half hours I spent there, I didn’t have enough time to fully appreciate all the areas that were accessible. Dotted along the path were bird hides where one could easily spend hours watching over a dozen species of birds flitting from branch to feeder to sedge. 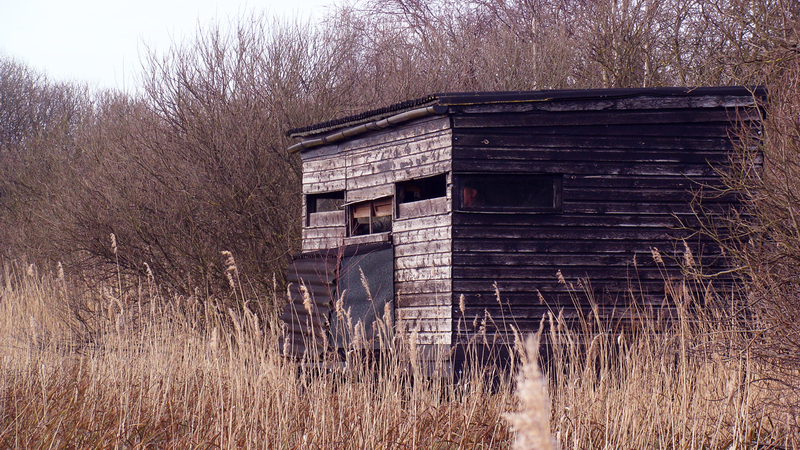 One of the three bird hides I passed during my walk through the fen. I won’t subject you to an even longer tale, trying to communicated all I saw and heard, but suffice to say I was very happy and felt very lucky to be exploring such a broad swathe of wilderness, preserved or restored. I made my way home at sunset, fighting the wind as cold air shifted across the flat country. This entry was posted in learning, recipes, travel and tagged Anglesey Abbey, Cambridgeshire, cycling, East Anglia, flour, mill, narrative, nature, oats, whey, Wicken Fen, wildlife on March 9, 2014 by Dylan Bargteil.